The list of Hobey Baker candidates is officially down to the top 10 and fans will have another chance to vote for their favorite player through March 31. Fans are allowed one vote per day on the official site of the Hobey Baker Memorial Award, but the fan vote accounts for just one percent of the overall selection process. The top 10 will be reduced to three finalists on April 4, known as the Hobey Hat Trick. It’s a diverse group as the list of 10 nominees includes six defensemen and four forwards made up of two sophomores, four juniors, and four seniors. The 10 players span across nine schools and five different conferences, including three nominees each from the Big Ten and ECAC. St. Cloud State of the NCHC has two representatives. Three players left their respective programs early to sign NHL contracts in recent weeks following the conclusion of their team’s season. The other seven are near locks in the Pairwise Rankings for the 2019 NCAA Tournament and five of the seven are still playing in their respective conference’s tournament. D | 37 GP, 16 G, 31 A, 47 pts. Duszak had a career year during his third collegiate season and finished third in regular-season scoring in the NCAA, while leading all defensemen in points. Following his season with the Lakers, the New York state native chose to forgo his senior season and signed an NHL contract with the Toronto Maple Leafs. The 21-year-old posted 99 points (30 G, 69 A) in 101 games with the Lakers and will join the AHL’s Toronto Marlies next. D | 31 GP, 9 G, 37 A, 46 pts. The first of four future NHL star defensemen nominated for the Hobey Baker this season, Fox led all NCAA players with 1.48 points per game. Fox’s NHL signing rights were traded over the summer and he could be on his way to the NHL by next season, if not sooner, where his two-way presence would make an immediate impact. In 95 games with the Crimson, the 21-year-old has recorded 21 goals and 93 assists for 114 points. LW | 36 GP, 15 G, 35 A, 50 pts. Crowned the Big Ten Player of the Year, Hirose led the nation with 35 assists and 50 points. He recorded an assist in his NHL debut with the Detroit Red Wings after signing as a free agent, forging his senior season. Hirose had been a key piece of the Spartans’ offense during his career, where the 22-year-old collected 116 points (33 G, 83 A) in 106 games. D | 32 GP, 5 G, 28 A, 33 pts. Drafted seventh overall last summer by the Vancouver Canucks, Hughes is a pure skater with an astounding two-way presence that helps rid skeptics of misgivings about his small frame. The defenseman signed with the Canucks last week and his long, prosperous NHL career as a No. 1 defenseman is moments away from starting. Still just 19, he’s the youngest Hobey Baker candidate; he’s even better than his 62 points (10 G, 52 A) in 67 games suggests. C | 35 GP, 17 G, 19 A, 36 pts. The second-year captain posted his worst statistical season since his freshman campaign, but his inclusion here showcases the true meaning of the Hobey Baker Award. His offensive totals were still good enough for 39th in the NCAA this season, out of more than 1,200 skaters. At 25, Jobst is the oldest on this list, but his 164 points (69 G, 95 A) in 149 games rank at the top. NHL teams will come calling soon. D | 36 GP, 15 G, 31 A, 46 pts. Perhaps the biggest name in college hockey, Makar has led the Minutemen to a season of firsts as the team captain and leading scorer. 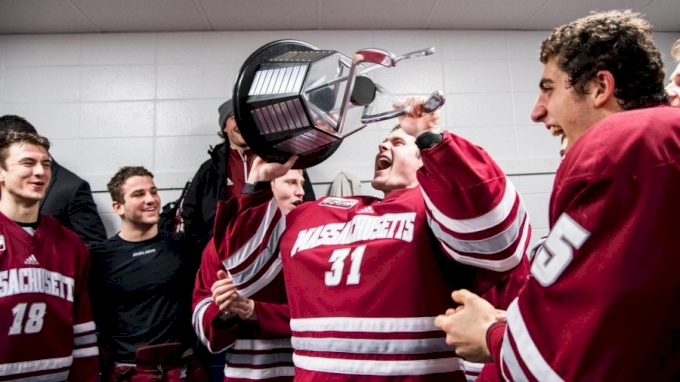 Makar is among the top NHL prospects and has carried UMass; he’s destined to finish first in defensive scoring come season’s end. The 20-year-old took a massive step forward—on both sides of the game—from his freshman season, racking up 67 points (20 G, 57 A) in 70 career games. RW | 36 GP, 19 G, 24 A, 43 pts. After three 20-point seasons with single-digit goals, Newell broke out offensively for 19 goals and 43 points, leading the Huskies in both categories. His breakout carried the Huskies to a top five national rank all season, spending all but two weeks at No. 1 since mid-November. At 23, Newell is among the oldest nominees, but he’s another acknowledgment to the award given his career stats of 36 goals, 80 assists, and 116 points in 142 games. D | 34 GP, 17 G, 22 A, 39 pts. Priskie’s offensive inclination made for a breakout in his fourth year with the Bobcats. The second-year captain has his team on the verge of the NCAA Tournament. Come the conclusion of the Bobcats’ season, the Washington Capitals prospect will likely put pen to paper on an NHL contract. His impressive offensive season puts him at 39 goals and 77 assists for 116 points in 152 career games, adding another element to his strong defensive play. D | 36 GP, 10 G, 23 A, 33 pts. The second of two Huskies to crack the top 10 finalists list, Schuldt is looking for another chance at the award after finishing in the top 10 for Hobey Baker voting last season. The third-year captain was another key component in the Huskies’ huge 29-4-3 record this season. The oldest nominee at nearly 24, Schuldt had a strong four-year career as a two-way defenseman with 116 points (38 G, 78 A) in 153 games. C | 36 GP, 14 G, 29 A, 43 pts. Sturm has increased his offensive output in each of his three seasons, leading to a 14-goal and 43-point season as the team leader. The German native could return for his senior season where he’d likely build on his junior year on both sides of the ice. But at almost 24, there have been rumors of his NHL availability. Sturm has promising career stats of 36 goals, 65 assists and 101 points in 115 games. Don’t miss your chance to cast your vote ahead of the March 31 deadline when the top 10 is cut down to three finalists, announced April 4.